(SAINT JOSEPH, Mo., Sept. 14, 2017) Success is the result of working hard and striving to make yourself better than you were the day before. That is why BioZyme® Inc., is excited to announce Whitney DeSalvo, Springfield, Ark., as one of its newest Vitalize® ambassadors. As a Vitalize ambassador, DeSalvo, will represent and promote the brand at various equine events. She is a firm believer in the products and feeds both the Vitalize Equine High Performance pellets and Vitalize Equine Free Choice Mineral to her horses daily. Vitalize Recovery Paste is her go-to product for her roping horse, Becky, after a long haul. She will also help coach younger girls interested in roping at various clinics in the future. The 22-year-old DeSalvo, whose mom also was a successful rodeo cowgirl, has been roping since she was 8. 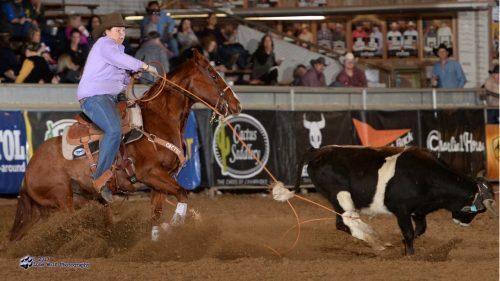 She is currently leading the standings in both the WPRA and the USTRC Cruel Girl circuit, with a nearly $22,000 lead in the WPRA standings. “All three of my horses look better since I started feeding Vitalize. They are staying filled out, and they are staying chilled out, which is the Amaferm® working to make their gut process feel better. I can tell when my mare’s stomach is bothering her, and she doesn’t want to perform, but I haven’t had those problems since I started her on Vitalize,” DeSalvo said.